MacResQ PowerBook G3 screen replacement, MCI offers 60 GB iBook drive upgrade, CardBus PCI expansion box for PowerBooks, and more. 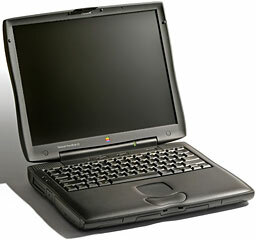 MacResQ has announced a new PowerBook G3 screen repair service as part of their PowerBookResQ repair program. The new service offers PowerBook G3 owners an affordable way to replace their scarred screen polarizers with PowerBookResQ’s famous quick turnaround and convenience. Soon after the first G3 Wallstreet PowerBooks were released in 1998, users noticed distracting marks on their LCD screens after a short period of use. These marks result from the LCD screen coming into contact with the PowerBook’s keyboard when the lid is closed. Oil from the user’s fingertips transfers from the keyboard to the screen, leaving the unsightly marks. If a PowerBook user doesn’t clean the screen regularly, these oils penetrate the ultra-thin protective cover on the screen known as the polarizer. Once the polarizer has been damaged in this way, the marks are permanent and affect the quality of the screen and the PowerBook. PowerBookResQ is pleased to announce an affordable solution for this problem. Rather than $500-800 for an entirely new screen, MacResQ technicians can now replace a PowerBook G3 polarizer and give the screen a new lease on life for $299. Like all other PowerBookResQ services, this price includes overnight pickup and delivery anywhere in the United States. The price also includes PowerBookResQ’s new PowerPad screen protector to prevent additional problems once the screen has been repaired. MCE Technologies LLC has announced that its iBook Hard Drive Upgrade Service, the largest commercially available service for upgrading the internal hard drive capacity in Apple iBooks, now includes a 60 GB upgrade option. This service includes the transfer of data from the original drive to the new drive and an option to trade in the original internal drive if it is in good working condition. MCE Technologies has rigorously tested and certified its hard drives for use in the iBook. The hard drives installed by MCE Technologies offer data transfer rates and access times as fast as or faster than the stock iBook internal hard drive. In addition, the hard drives installed by MCE Technologies carry a full 3-year warranty, compared to just one year of warranty coverage for the computer’s original internal hard drive. Current upgrade capacities now available in the MCE iBook Hard Drive Upgrade Service are 10 GB, 20 GB, 30 GB, 40 GB, and 60 GB. To take advantage of the MCE iBook Hard Drive Upgrade Service, customers must send their Apple iBook to MCE Technologies in Irvine, California, where the upgrade is performed by trained technicians. Data is transferred from the original internal hard drive to the new internal drive if so requested. Pricing for the MCE iBook Hard Drive Upgrade Service, which includes 2-day return shipping to the customer, is $199 for 10 GB, $239 for 20 GB, $279 for 30 GB, $299 for 40 GB, and $499 for the new 60 GB upgrade. Turnaround time is generally 2-3 business days. The service is available immediately. Doug’s AppleScripts has posted Make Mine MPEG-4 v2.0. Make Mine MPEG-4 is an AppleScript applet that lets you import CD Tracks into iTunes and then encodes them as MPEG-4 files using QuickTime 6 Pro. The tracks are then added to your iTunes Library. MPEG-4 encoding allows for higher quality audio at smaller bit rates – and thus smaller file sizes. This latest version of Make Mine MPEG-4 runs properly under Mac OS X 10.2 (Jaguar), imports all available tag data from the CD audio track entry and enters it in the finalized MP4 entry in iTunes, and works around QuickTime’s 31 character filename limit. Doug’s AppleScripts is a site offering free AppleScripts for iTunes and SoundJam, as well as resources for users who write them. The Apple Store has launched a new Hot Deals program specifically for the education market. Dubbed “More Back to School in Style,” the program provides an instant $50 discount on any qualifying iBook through September 25, 2002. The 300L (Nylon) carry case is tailored especially for the Apple Titanium G4 and new iBook. The design teamat e-pac have taken on the challenge to create a slim line carry case which is lightweight but still offers the ultimate in protection. The L300 case is stylish and sleek, and it has an innovative lightweight frame casing that will protect your hardware, making the e-pac one of the safest systems for transporting your portable on the market. e-pac has a double wallet storage system, which has tailored pockets to hold all your accessories, such as leads and battery, along with pockets for pens and cards, etc. There is even a removable CD wallet and space for a note pad, so you can carry as much as you like using one or both of the wallets for safe tidy storage of all those extras. The e-pac 300L Nylon Case for iBook and TiBook is available at the Applelinks Store. This 2 Slot CardBus PCI Expansion System allows you to add PCI slots to an Apple PowerBook or PC laptop.This new expansion chassis will provide the music, video, satellite communications and other industries the long awaited professional mobile system. All this potential in a 15.144″ x 10.00″ x 2.57″ chassis that weights 5.3 pounds. The 2 slot system supports two full-length PCI cards and includes mounting brackets for a maximum configuration of two 1″ disk drives or one 1.6″ disk drive. Cooling fans provide cooling for your PCI cards and disk drives. Model #CB2S includes a built-in Ultra2 SCSI controller with an internal and external connector. Model #CB2 has no SCSI controller. Model #CB2SDC includes a built-in Ultra2 SCSI controller. Both DC models include an XLR-4 pin power connector, and are shipped with a 100-Watt DC power supply (power brick), for those occasions when AC power is available. Nisus Writer and Nisus Email, with their modest hardware demands, make good software choices for portables. Nisus Software has announced that they have started a new list to discuss all Nisus products and related subjects. The Nisus Interactive List is a place to discuss any and all things Nisus. The list is archived, so it is a great place to start looking if you have a problem. Have a problem with Nisus Writer? Want to share a tip about Nisus Email? Feel free to post it on the list. However, politics, religion, spam, and flaming others are not allowed. Want to own the most expensive PowerBook ever for just $99? Back in August 1995, when Apple unveiled its first PowerPC PowerBooks, the top-of-the-line PowerBook 5300ce sold for – take a deep breath – a wallet-numbing $6,500, making it one of the most expensive Macs of all time. Now you can have one from Wagener Media for one-sixty-fifth of that price. Need a basic word processing and email machine? The 5300 is plenty capable for that sort of duty. Specs include 117 MHz PPC chip, 32 MB RAM, 1 GB HD,10.4″ 800 x 600 LCD TFT color display. You can add an ethernet/video card for $20 extra. These machines are refurbished and include a 30 day guarantee – or buy an extended 1 year warranty for $45 extra.